Cereal is a popular breakfast food — and for good reason. It’s ready-made, it tastes good, and it can even give you some much-needed vitamins and minerals first thing in the morning. There are some pitfalls to consuming cereal for breakfast, however. Some brands contain a lot of sugar and salt, while others contain little in the way of fiber. This kind of cereal is likely not good for your waistline. To make sure you’re getting some nutrition along with your breakfast — and not just empty calories — why not consider buying unsweetened oat cereal? A recent U.S. study noted that weight loss and consumption of fiber both lower can low-density lipoprotein (LDL) cholesterol levels. So they set out to evaluate whether or not a whole-grain, ready-to-eat (RTE) oat cereal containing viscous fiber as part of a dietary program for weight loss could lower LDL cholesterol levels and improve other heart disease risk markers more than a dietary program alone. About 140 obese adults participated in the clinical trial. Two portions per day of whole-grain RTE oat cereal (containing three grams/day oat b-glucan) were given to one group of participants. Another group acted as control and were given “energy-matched” low-fiber foods. The goal was to give both groups a reduced energy dietary program that lowered caloric intake about 500 kcal/day. The dietary intervention also encouraged limiting consumption of foods high in energy and fat, portion control, and regular physical activity. The researchers then measured fasting lipoprotein levels, waist circumference, triceps skin fold thickness, and body weight at baseline and weeks four, eight, 10, and 12. 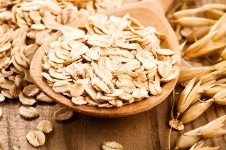 The researchers concluded that eating a whole-grain RTE oat cereal as part of a dietary program for natural weight loss had favorable effects on fasting lipid levels and waist circumference. Now you have a great idea for what type of cereal to buy the next time you’re out grocery shopping.